Impairment of biliverdin reductase-A (BVR-A) is an early event leading to brain insulin resistance in AD. 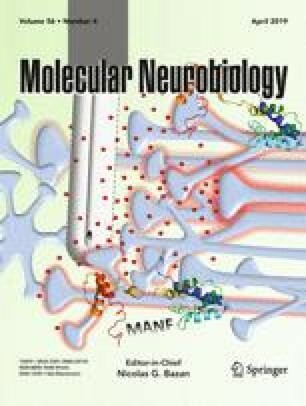 Intranasal insulin (INI) administration is under evaluation as a strategy to alleviate brain insulin resistance; however, the molecular mechanisms underlying INI beneficial effects are still unclear. We show that INI improves insulin signaling activation in the hippocampus and cortex of adult and aged 3×Tg-AD mice by ameliorating BVR-A activation. These changes were associated with a reduction of nitrosative stress, Tau phosphorylation, and Aβ oligomers in brain, along with improved cognitive functions. The role of BVR-A was strengthened by showing that cells lacking BVR-A: (i) develop insulin resistance if treated with insulin and (ii) can be recovered from insulin resistance only if treated with a BVR-A-mimetic peptide. These novel findings shed light on the mechanisms underlying INI treatment effects and suggest BVR-A as potential therapeutic target to prevent brain insulin resistance in AD. The online version of this article ( https://doi.org/10.1007/s12035-018-1231-5) contains supplementary material, which is available to authorized users. EB, TC, and MP designed the study. EB, AT, FT, SC, and FDD performed the mouse experiments. TC and SG performed the behavioral tests. CR performed the electrophysiology experiments. EB, TC, MP, CG, and DAB analyzed and interpreted the data. EB and MP drafted the manuscript. All authors revised the manuscript critically for important intellectual content and approved the final version.